I made a post a couple days ago about Claire Boucher’s new music video, I’m not sure that I was clear enough – I loved it. But it seems, she may have not read what I said exactly, I never said that her collaborative changes made any bit of previous style/sound suffer in comparison, rather I admitted it was different, and that is a good thing, to variate from your “normalcies”. You must fractal from your cycle, that is how you take on new process’ and begin to evolve within your own realm. I am happy that she still talks to us, and is listening, but every one of her fans should be continuing to support her, if we expect her to continue making us music! We love you Grimezy baby! 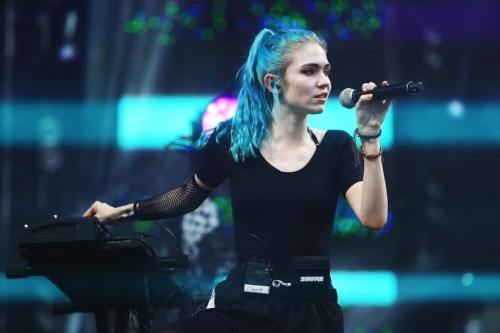 “Grimes first linked up with Fun. co-leader Jack Antonoff on “Take It Away,” a 2014 song from Antonoff’s solo side project Bleachers. And now they’ve teamed up once again, this time for an absolutely dazzling pop song called “Entropy.” It’s a power-pop tune, more or less, with the same sort of sparkling production that Antonoff brought to Taylor Swift’s “Out Of The Woods.” But it’s very much a Grimes song, too, with that otherworldly echoing reverb all over Claire Boucher’s voice. The song will appear on tonight’s episode of HBO’sGirls. They’ve shared it a bit early, which is nice, since it’s also a pretty perfect Sunday-morning soundtrack. You can hear it below..